It had been grey and miserable for more than a week now. We should have been delighted; after a couple of early snow storms and a great big high parked over New Zealand, the weather should have been perfect, but the (in)famous upper Clutha inversion was robbing us of vitamin D (and views of the new snow). 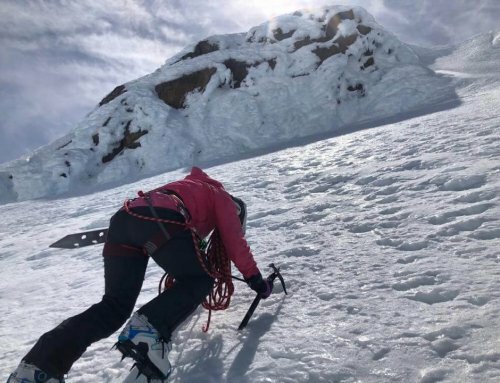 Although last week’s storms had dumped a considerable amount of snow for May, it was still early for Ski Touring; the weather had come from the sou-west and we wanted somewhere close to the main divide to ensure there’d be enough snow to ski. The day of the trip didn’t disappoint; the same grey cloak clung to the low slopes above Lake Hawea as we drove north to the pass. But the four of us were quietly confident that we’d be able to climb above the clag. So quiet infact, that no one dared to mention the “what if the cloud goes all the way to the top?” scenario. Snow, as well as bush detritus fell down our necks and coated our hair as we grunted and thruched upwards. Were we having fun? Definitely, although it was a little ‘type 2’ at times. One final skis-off thicket later, and we finally reached the actual bush line. It’d only taken 2hrs to climb the 600m or so vertical from the road, so I spose it wasn’t really all that bad going after all. Two of our team were extremely good skiers, and since they managed to skin up through the top section of bush, they figured they could also ski down. What a terrifyingly brilliant experience… Turns on amazing snow, sliding through tiny gaps in the trees, pulling over fallen logs and among the grabbing branches. The two out in front were smilling all the way. The two at the back were grimacing, barely in control. Thankfully the snow petered out and the bush closed in just as my energy was failing. Ski’s off and tramping boots on, we made the final transition from bush skier to ski-carrying-bush-basher.